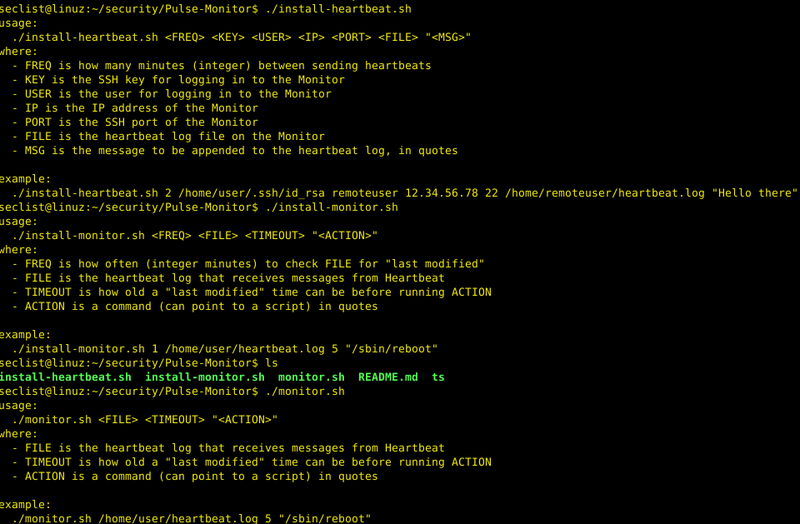 Browse: Home / Pulse-monitor : A client + server tool to to log and rectify communications problems. 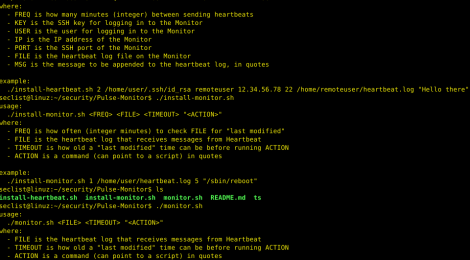 The Heartbeat computer (server or client–doesn’t matter) delivers messages to a file on the Monitor computer via SSH. The Monitor checks the file and executes remedial action if conditions are met. Server and client can fill either role assuming a VPN or reverse SSH tunnel exist. Frequency, timeout, and remedial actions are all configurable. 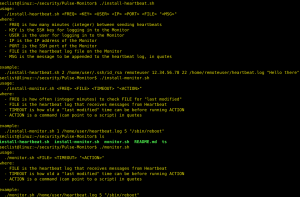 git clone https://github.com/viiateix/Pulse-Monitor && cd Pulse-Monitor Example: ./install-heartbeat.sh 2 /home/seclist/.ssh/id_rsa remoteuser 12.34.56.78 22 /home/seclist/heartbeat.log "Hello there"
./install-heartbeat.sh 2 /home/seclist/.ssh/id_rsa remoteuser 12.34.56.78 22 /home/seclist/heartbeat.log "Hello there"
← remediation – Tools and utilities for remediation and incident-response handling.